Youths for Autism (YFA) is an internship programme that is meaningfully structured within the special education sector. The internship duration should preferably be six months and above. This is to enable learning and contribution. Have an interest for using Info-communication Technology (ICT) tools to create teaching resources. We recognise your potential to serve through your enthusiasm, vibrancy and fresh ideas. You can use these skills to help our students learn as you work alongside our teachers and therapists. This includes teaching our students social skills and life skills that help them be more independent and life-ready. As a YFA intern, you form a critical part of the support network for our students. In short, you will make a difference to their lives. We look forward to your contribution in impacting the lives of our students with autism. This internship will provide you an opportunity to experience working in this community. You will gain exposure and learn the various ways to help students with Autism progress - academically and socially. You will learn first-hand about the challenges that students with autism faced. Some of these challenges are not easy to overcome: lack of societal awareness, job discrimination. Along the way, you will see our students grow. And you will grow with them. Ex-YFA interns say this journey has been 'transformational' and 'life-changing' for them. Many also forged strong bonds with their peers and return to support the students, despite their busy schedules. We warmly welcome you to experience this yourself. Make a difference to your life by making a difference to others! As part of 21st Century learning, the school is moving towards digitalising teaching resources and encouraging the use of ICT in lessons. Our teachers and therapists will benefit as they gain a better understanding of each student as you videotape their learning progress in class. You can increase your technological portfolio as you will pick up skills such as video production, video editing and digital design to help in creating digital resources to enhance and expand our teaching tools. Play a part in supporting our school's special events and the students' learning journey as you are assigned into Event and Subject Committees. Work together with our educators to plan, execute and implement exciting activities for our students. You will also build learning support programmes, and develop teaching and learning resources to enhance the students' experiential learning. You will be taught strategies to engage students so that they focus and learn. In class, you will work closely with teachers by managing the behaviours of students and helping them learn. You also provide differentiated, one-to-one intensive support to those who require more help. It is not just any other internship! Read what our ex-YFAs have to say about the programme. I enjoyed interacting with the children the most because they always bring a smile to my face no matter how tiring the day is. One thing that I enjoyed the most is my daily interaction with the students. They are so happy and joyful that they manage to cheer me up everyday. Forging bonds with the students is one of the things I've enjoyed. Each of them are just so special and precious. Every day was an enriching experience. I learned and grew each day with the students, whether it was a good day or a tiring one. It was a very meaningful experience getting to know the students and striving with my very best effort to help them overcome their barriers. The internship is an eye-opening experience. It taught me to embrace my own strengths and confidence to be a more mature person. The internship gave me a chance to make a positive impact to the students and making new friends with the common goal of helping children with autism. I enjoyed understanding autism through interacting with my students. I hope to use this experience to help other children with autism in the future. I enjoy working in an environment where colleagues are like-minded, passionate and good at what they do. I realised that behind their veil of social-awkwardness, each person with autism is a unique individual with their own set of personalities. The YFA programme has shown me that I can be an agent of change in the special needs community. The thing that brings me the greatest joy is whenever a student flashes a genuine smile from within. Working in Pathlight can be both mentally and physically challenging but these moments have taught me how to mature into an adult. Having observed the behaviours of children with autism, I've become more sensitive to their feelings and learnt to empathise rather than pity. Youths for Autism was a dream come true for me: to be able to earn some keep and serve the community at the same time. After this internship, I am more certain that I do want to work in the field of autism. The experience I gained would stay with me for a long time. Autism Resource Centre (Singapore) is a non-profit organisation started by volunteers, dedicated to serve children and adults with Autism Spectrum Disorder to help them lead meaningful lives in society. ARC(S) aims to highlight the needs of these individuals and to increase understanding and awareness of autism in the community. Pathlight School is the first autism-focused school in Singapore that provides a blend of mainstream education and life-readiness skills for individuals with autism. It takes in students from ages 6 to 18 years old with mild to moderate autism. Most of the students are taught mainstream academics and take national examinations (eg: PSLE, 'N' and 'O' Levels), while a selected group of students are taught vocational skills. Employment and Employability Centre (E2C) aims to provide necessary job training and support so that persons with autism can perform optimally in the workforce. WeCAN Early Intervention Programme provides direct intervention to young children with autism aged 2 to 6 years old and is the first internationally accredited early intervention programme in Asia by the National Autistic Society, United Kingdom since 2008. Autism Association (Singapore) is a charity organization under the Charities Act, Singapore. It was originally set up through the initiative of a group of parents. It aims to initiate, organise and support provision of a broad spectrum of services for people with autism in Singapore. These services encompass education, vocational and life skills training and residential care. Eden School is a vocational school which takes in students from ages 7 to 18 years old with moderate to severe autism. They are taught vocational skills and life-readiness skills which help them cope with day to day living. Eden Centre for Adults serves individuals with autism who have completed their special school programs. Eden Children's Centre provides early intervention programs for children aged 2-6 years old diagnosed to be on the Autism spectrum. Who can apply for this internship? Do I have to go through a selection process? Yes, all applicants are required to submit an application form. Shortlisted applicants will be contacted to come for an interview. We regret that due to limited resources, only shortlisted applicants will be contacted. 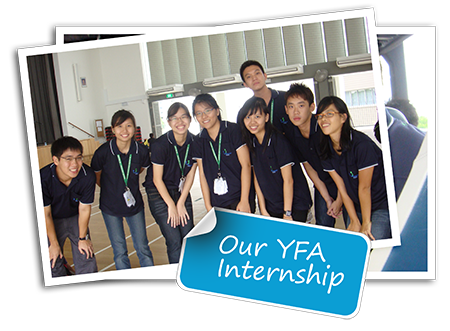 The YFA internship programme usually receives an overwhelming response. We encourage you to apply as early as possible. Applicants should preferably apply a minimum of two months before the commencement of the internship. For instance, if you are available from January to June next year, please apply by October this year. The bulk of interviews will be held in end-July to August, and/or mid-September to October for those interested to serve from Jan to June the following year. We note that JC students must sit for their Prelims and A'level examinations. We will steer clear of these dates for the interviews. Interviews will be held from April to June for those interested to serve from July to November. I have been nominated by my school for this internship. Do I still need to apply? Yes, you will still need to apply. Each year, we write to school principals and civics tutors requesting them to nominate exceptional students interested to pursue an internship in special education. However, student nominees will still need to go through the application process. We will offer the internship to applicants who are suitable and qualified. I will be serving National Service for the next two years. After I ORD, I have a period of three to six months before I enter university. Do I apply now for the internship? There is no need for you to fill up the application form at this moment. But you can register your interest here. We will be contacting you closer to your ORD date. I'm a Polytechnic/University student who will be on semester break from May to late July. Can I apply to take up this internship during this period? Alternatively, we also welcome you to volunteer with us. I cannot commit for six months. Can I still apply? YFA interns will first undergo intensive training in autism intervention strategies. They will also need sufficient time to know the students well. This ensures that they can work with them effectively. It can be highly disruptive in terms of learning for our students if YFA interns change frequently. Where will I be posted to as an YFA intern? Interns are deployed to departments based on the respective needs of the participating organizations and interns' suitability. For more details of participating organisations, please refer to "Where I Go"
The number varies from year to year depending on the total demand of the organizations. I do not know anything about autism. Can I still apply? Yes, knowledge in autism is not required as training on autism will be provided to you. You will be equipped with strategies on how to interact and work with students with autism. What education-related projects will I be involved in? I may need to take leave to attend university admission matters. Will I be able to do that? Yes, YFA interns are allowed to take leave or time off to settle university admission matters. I would like to travel during my internship. Will I be able to apply for leave? The existing school policy is that staff are not allowed to take leave during the School term. As such, we encourage both staff and YFA interns not to take leave for travel plans during these six months to minimise disruption to our students. How much will I be getting for my work as an intern? The selection process to become YFA is rigorous. Beyond grades, we are looking for passionate, dedicated individuals committed to the cause of special education. CCA and CIP achievements will demonstrate that you have the tenacity and 'heartware' to outlast the demands of the work. * Dates subject to slight changes. ^ Depending on organisation and department you are assigned to. Limited Vacancies Available. APPLY TODAY! Thank you for your interest in Youths For Autism (YFA) Internship Programme. Please click on the button below to download the application form. Complete the application form by typing your details into the Grey Boxes. If a Column is not applicable to you, please indicate "NA". Due to limited vacancies and resource limitations, we are sorry to inform you that only shortlisted applicants will be notified. to submit the application form or to enquire other matters about the internship. One of the most satisfying things about my internship is that I was able to watch my students grow. My deployment to Alder gave me the luxury to constantly work with the same group of students and to work towards improving some of their behavioural issues. Working at Pathlight has definitely been a life-transforming experience for me. I have not only learnt to become a better communicator with children, I have also open my life to the world of autism. Previously, I thought autistic children were 'difficult children'. True enough, sometimes it can be very challenging to teach them and communicate with them, as it takes a mountain of patience. However, if I have not worked at Pathlight, I would not have known that autistic children are equally lovable as normal children. They, too, need the care, concern and encouragement showered to them. They are children who have a zest for learning, and playing. They are children who have hobbies, who play beyblades, pokemons and even doraemons. They are children capable of bringing sunshine to our lives. Pathlight school; where lives are transformed. This statement holds really true to me, for I am proud to say that this internship has transformed my life, and given me an experience I am sure I would not have gotten in any other holiday job. My journey with autism did not come easy because I was rather apprehensive about what was to come. I did not have prior encounters with children and youths with autism. This internship has taught me to embrace vast differences from these wonderful children who happen to have special needs. I have learnt to appreciate their inner strength and potential. In Pathlight, many opportunities have been given to these children, no matter the costs, just to bring out the best in them. My journey with autism has been insightful and life-transforming. And it would not have been such a rewarding one if not for all my mentor teachers, my job coaches, my track head, my fellow interns and definitely my students! I sincerely love all the students I have ever taught and it really makes me so joyful to see them shine from the inside out. I now dare say to every single Pathlighter: what makes you different makes you beautiful. The past two months have been truly memorable, in every sense of the word. There were times when I was challenged and filled with doubt, as I looked at a child, or rather, a fully grown teenager, struggling with even the most basic of tasks even after hours of prompting and teaching, when outbursts followed outbursts, seemingly without pattern, reason or remedy. Those were the moments when the full immensity of the task which faces every staff in Pathlight hit and staggered me. But above all, there were times of genuine joy. The earnest greetings I get each morning, the stories, emotions and dreams that my students share with me during recess or as we walk between lesson venues, the special moments when a student demonstrates, through a correct answer in class or a positive change in behaviour, that he or she is not going through the days rigidly, but is actually learning - these have made every school day thoroughly enjoyable. And these are the very same reasons why I am convinced that our students, though special, are not very different from the rest of us. They are individuals who err, who feel anger and frustration, very much like you and me. Like us, they have hopes and longings and are plagued by fears and uncertainties. And like us, they have the incredible ability to change, to learn and to grow into richer human beings. But for this, they need good teachers, just as all of us do. That is the realisation that has made my past few months in Pathlight more than memorable; it has been meaningful. Apart from being able to be a part of the special needs community, and being a part of my students' lives, I think the one thing I enjoyed most from this programme, was the opportunity to understand autism, and impact lives. Every morning, I enter the school, I enter work, feeling cheery and purposeful, because of the meaning of my work, and the smiles of the students. Everyday is a day to build relationships with these students whom I would have never been able to meet without this programme. Everyday is a day to learn from them, about the purity and innocence of life from different perspectives, and everyday is a day to help them improve in terms of their behaviour/social skills. The programme allowed me to erase my stereotypes, and truly appreciate the sanctity and dignity of life. I enjoyed working with my students, creating meaningful relationships and making a difference in society. The thing I enjoyed most was undoubtedly seeing my children's smiles everyday. Their happiness and joy motivates me to come to work. It is also heartwarming to see my students improve and getting better through the teacher's assistance. Though tiring, this was a very fulfilling internship that I would never regret joining. I enjoyed learning and growing with my students for the past 6 months. We not only transformed the lives of our students but also transformed our own lives. The students' unpretentious and straightforward nature, the way they laugh at the simplest things I said, how they are forgiving, trusting and genuine, reminded me to never lose this child-like faith, hope and love. To be able to meet and work alongside other interns who shared the same passion inspired me to grow to become more convicted to this cause. I enjoyed the daily interaction with the staff at Pathlight School. Some students can be challenging to manage but they are all very adorable. I grown to like them more as each day passes. The teachers are fun loving and it was nice working with them. Lastly, my fellow YFA interns are friendly They fill my daily internship at Pathlight School with so much fun!